Ripe avocado cleans all the traces of makeup from face. get rid of those baggy eyes try using avocado paste. Avocado helps to remove dead cells from lips. It acts as excellent exfoliating agent. Ripe avocado cleans all the traces of makeup from face. To use avocado for makeup removal cut a ripe avocado into two and take the oil using cotton ball. This oil on cotton ball is best for makeup removal which also repairs the skin damage caused by makeup. If you want to get rid of those baggy eyes try using avocado paste. Applying avocado paste all over the eye area not only helps to remove puffiness but also remove fine lines. Eating avocado on daily basis ensure no under eye darkness and wrinkle free skin. The fact relies in the truth that avocado is rich in Vitamin E and other healthy fatty acids. Avocado helps to remove dead cells from lips. To make lips pinky and soft apply avocado on lips and massage gently. You can even add some salt or few drops of essential oil to boost blood circulation in lip area. It acts as excellent exfoliating agent. Mix 2 tablespoons of sugar and a teaspoon of honey with half piece of avocado and rub gently. It will remove all dead cells and give clear skin. Using mask of avocado with honey and egg regularly for a month gives a fair glowing skin. For this make a mask using ripe avocado, two tablespoon of honey and one egg white. Apply on face and leave for 15-20minutes.Wash off with cold water and enjoy flawless skin. 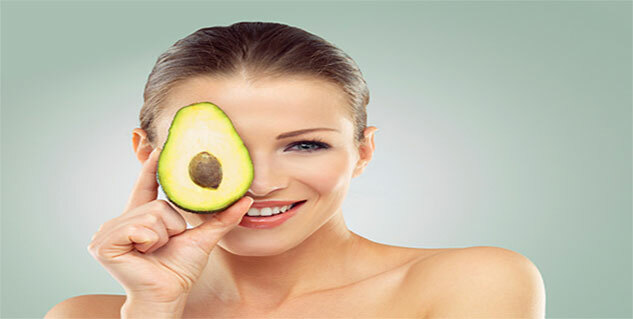 So add avocado in your beauty regimen today to enjoy benefits of great skin.